We also provide First Class Boarding and Grooming. Upland and Waterfowl Gun Dog Training - Here at Boberosa Gun Dogs we specialize in training upland gun dogs for the hard working hunter. We are hunters first and we understand the needs of a good quality hunting companion. With 33 years of combined professional training experience we offer training packages for all breeds of gun dogs. 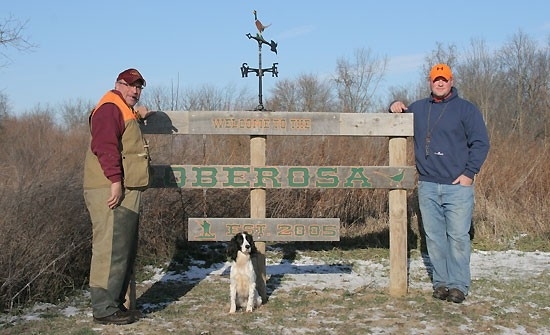 Over those years many flushers, pointers, and retrievers have been proud to be Boberosa Trained! Individual Attention - Our specialty is in the individual attention each owner and hunting companion receives while they stay at the Boberosa. Each hunter has specific expectations of exactly what they want out of their hunting companion. After an initial evaluation we will sit down with a new client and hammer out exactly what they want from their hunting partner. We then tailor a specific training regiment for that hunting companion, and the needs of their owner. There is no carbon copy training regiment here. Each dog has a specific course laid out for them based on their temperament, drive, retrieving ability and the owners needs. Family companions are boarded as if they are part of our family. Your companion will receive individual attention and regular exercise. Communication - Communication is key in the training process. We offer weekly training updates on all of our dogs via Facebook or Twitter. Pictures and updates of your dogs progress will be available to you via those sites as well as email communication. We want the owner to be involved in the training process. In our opinion the owner and hunting companion must be on the same page. We tailor specific training sessions with the dogs owner for that true partnership to develop. We expect you to have all the tools in order to handle your newly trained hunting partner.